Maturation: Bourbon casks with Sherry cask Finish. Buying Advice: 😀 Positive. Good Price/Quality Ratio. A few flaws! Nose: The Sherry Cask influence is obvious. Lots of Dried Fruits like Sultanas, Raisins and Apricots. A long time ago I had some fortified wine in the South of France near Perpignan and the border with Spain. I believe it was called Muscat de Rivesaltes and this Tomatin brings back those (literally) sweet memories. I also find Sweet Barley, Buttered Toast, Butterscotch, Vanilla, Heather-Honey, both Sweet and Tart Apples, Blackberries, Cinnamon, Clove, light Pepper, Dusty Sand Road and faint hints of Leather, Toasted Oak and Tobacco. The Alcohol is not fully integrated and it actually stings a little. Palate: Good delivery thanks to the adequate ABV. A combination of Sweet Sherry, Spices and Wood. I find Sweet Barley, Butterscotch, Vanilla, Dried Fruit, Sweet Apples, Heather-Honey, Orange, Dark Chocolate, Pepper, Nutmeg, Clove, Ginger, Dusty Road and hints of Leather and Tobacco. The Alcohol remains present. Finish: Long and Spicy. It's Oily as well and it coats your mouth nicely. Quite Dry and Oaky towards the end with a light Alcohol burn that I could do without. I also find Sweet Barley, Toffee, Vanilla, Dried Fruit, Nuts, Heather-Honey, Clove, Nutmeg, Pepper, Cinnamon, Ginger, Citrus, Dark Chocolate, Sweet Red Apples and Toasted Oak. I added a few drops of Water and in all three departments the Alcohol is less noticeable now. That's a good thing! I do get a little extra Menthol in the Finish. I would advise to add a few drops of Water in this case. 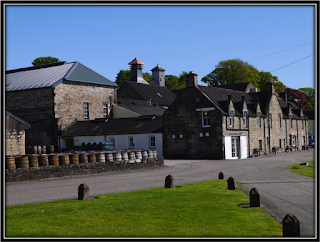 Tomatin was founded in 1897 by the Tomatin Spey Distillery Company. In 1985 the distillery went into liquidation and was bought in 1987 by Takara Shuzo Co. and Okara & Co, both from Japan which was quite remarkable at that time. In fact, Tomatin was the first Scottish distillery that became fully owned by Japanese companies. Currently the shares are being hold by Takara Shuzo (81%) Marubeni (14%) and Kokubu (5%). Tomatin has always been a distillery that produced large quantities of Spirit for Blends but in the last 10 years they started to concentrate on producing and marketing Single Malts. As a result, the production decreased from well over 10 million litres in the 1970's/1980's to around 1,6 million litres this year. They still produce Blends as well though. (Antiquary, Big T and the Talisman). Today's Single Malt core range includes the NAS Legacy, the 12, 18 and 36 years. In 2016, new packaging and bottles were introduced for the entire core range. The 18 years I'm reviewing today was introduced in 2006. 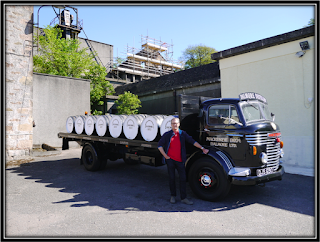 We visited Tomatin in May this year and we really enjoyed the Tour and the Tasting session despite the fact that it was Friday afternoon when the production is stopped to be able to clean the equipment. At one point in time in the 1970's Tomatin was operating a staggering 23 stills. 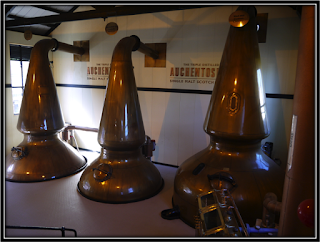 Today there are still six pairs of stills but only 4 of the spirit stills are being used. The Lyne arms of the round, tall and slim copper stills point either straight or slightly upwards creating a Sweet and Malty medium bodied Spirit. The water is sourced from the Allt-na-Frith (the Free Burn). 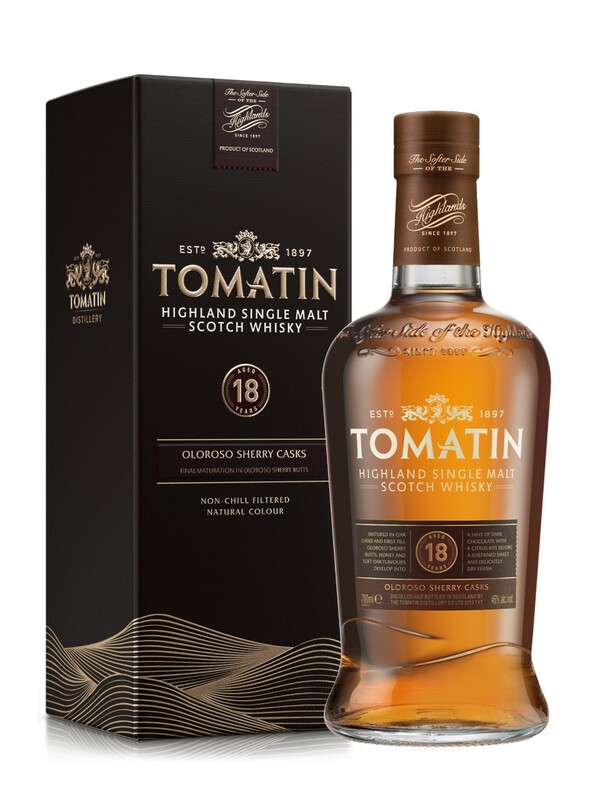 The Tomatin 18 Years matures for over 16 years in Refill Bourbon casks bought from Maker's Mark. The spirit is then finished for at least 18 months in First Fill Spanish Oak Oloroso Sherry butts. These butts must have been of reasonable quality as I get no Sulphur notes. 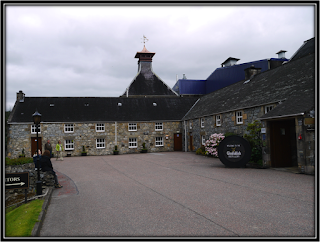 The Tomatin 18 Years shows that this Distillery deserves its place on the Single Malt map. It also shows how important good casks are. In this case the Sherry butts certainly left their clean marks. This is especially noticeable on the Nose where you can discover a variety of (mostly) Dried Fruits. 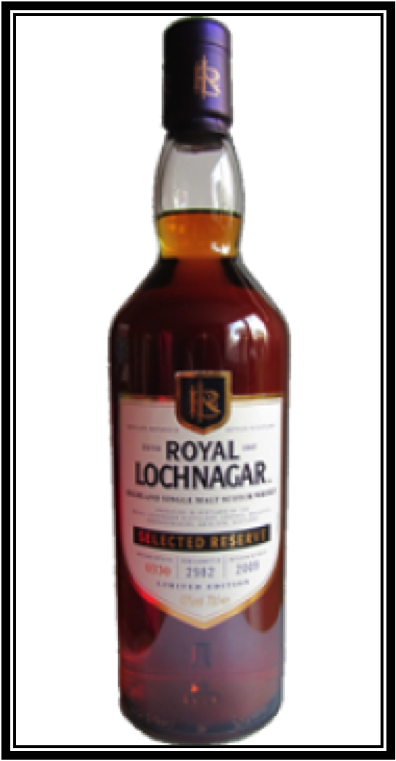 It's not a perfect Malt though as Spices, Alcohol and Wood are slightly dominant on the Palate and certainly in the Finish. In this case I think the Spirit would probably have benefited from a few years less cask time and perhaps a slightly lower ABV. That way, you might preserve some of the Fruit for Palate and Finish. 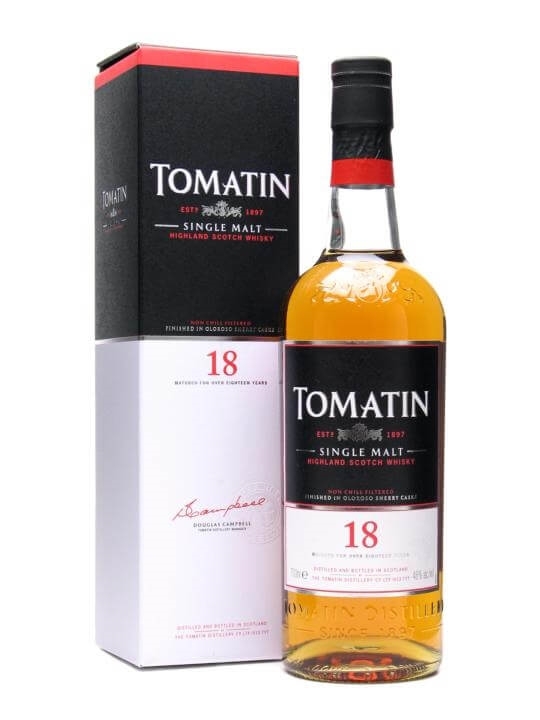 These are all minor flaws though and the Tomatin 18 years is actually extremely drinkable. You better take care if you have a bottle at your side on a cold winter's night. Buying Advice: 😐 Neutral. Price/Quality ratio is okay. ABV too high for this young Spirit in my opinion. Crisp and Clean but with a Young feel to it. The Alcohol is quite present so you need to find your way around it. On the Nose, the Valinch is mostly Sweet with Fruit, Oak, and Herbs. A few Floral, Mineral and some slightly Sour notes as well. I find impressions of Malted Barley, Toffee, Vanilla, Brown Sugar, lightly Burnt Toast, Grass, Straw, Apple, Grapefruit, Mandarin, Lemon, Grapes, Raspberry, Banana, Salted Almonds, Coconut, Butter, Cinnamon, Ginger, Nutmeg, light Menthol and hints of Papaya Cream and Floral Soap. Young, Bitter Sweet, Fruity and Spicy. The Alcohol is quite noticeable. I find Malted Barley, Vanilla, Butterscotch, Apple, White Grapes, Grapefruit, Mandarin, Banana Ice Cream, Nectarine, Raspberry, Lemon, Salted Almonds, Pepper, Ginger, Cinnamon, Nutmeg, Clove, light Menthol, Charred Oak and some Mineral notes. A bit of Melon after a while as well as a light Metallic note. Middle-Long, Young, Bitter-Sweet and Spicy. The Alcohol is quite strong and reminds me of a Young Grappa from time to time. I find Malted Barley, Vanilla, Grass, Straw, Cocoa Powder, Lemon, Grapefruit, Raspberry, Pepper, Cinnamon, Nutmeg, Oak, Almonds and a light Metallic note. Quite Dry after a while. I added 3 drops of Water and that does take away some of the Heat, especially on the palate. The Vanilla and Fruit develop a bit better this way. You will get some additional Floral tones as well. The Valinch accepts 3-4 drops of Water. Be careful though as too much Water will completely kill the Valinch. The Auchentoshan distillery was founded in 1823 by John Bulloch and is located in Dalmuir/Clydebank, close to Glasgow alongside the A 82. 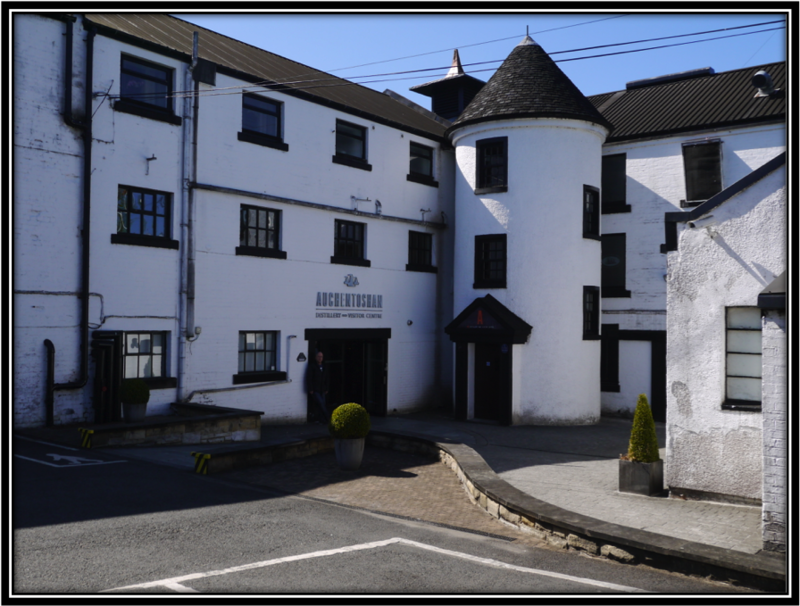 It's in the hands of Morrison Bowmore (Suntory) since 1984. The new visitor centre was opened in 2004. The Core range consists of the NAS American Oak, the NAS Threewoods and the 12, 18 and 21 Years (June 2017). 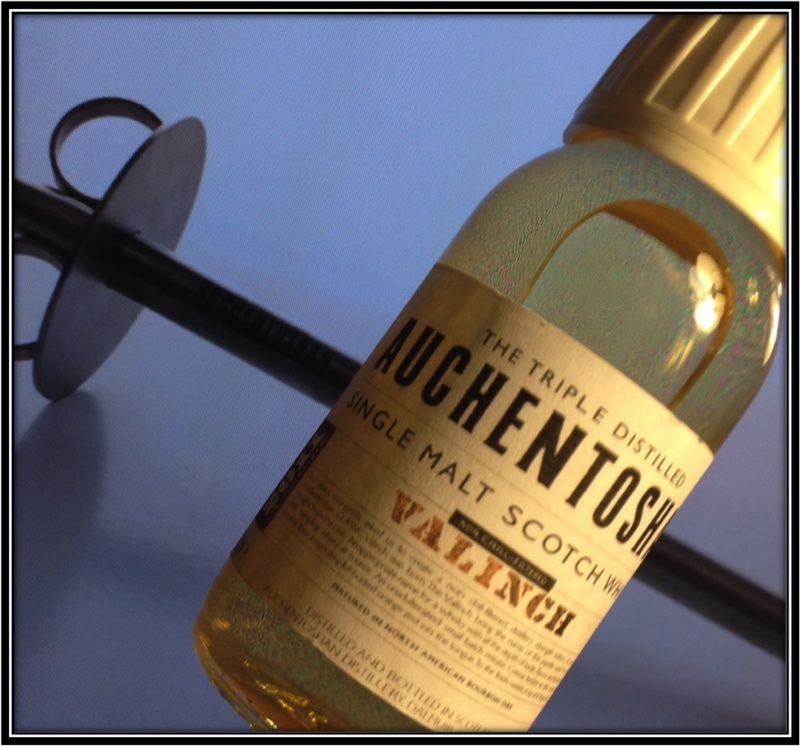 The Valinch was launched in 2011 as a Limited Release at the request of many Auchentoshan fans. 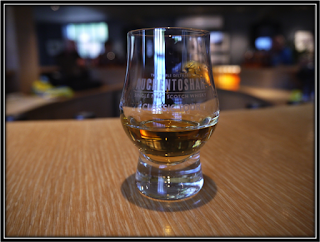 The idea was to create a Non Chill-Filtered, Cask Strength version of the popular Auchentoshan Classic. The Valinch is the name of the large metal (copper) pipette that is used to draw Whisky straight from the cask. Auchentoshan is the only remaining Scottish distillery that still practises a full triple distillation for all its Whisky. There are of course three stills, One Wash -, One Intermediate - and one Spirit Still. Triple distillation guarantees a Delicate, Light, Floral and Fruity Spirit. The Water for the Whisky is sourced from Loch Katrine. The Valinch matured in First Fill Ex-Bourbon casks made of American Oak. Drinking Experience Neat: Good. The Alcohol is quite strong though. Conclusion:Give More Power to the People. Good initiative by Auchentoshan to give their fans a fortified version of the Classic. However, a good Single Malt is not just about a high ABV. A high ABV usually benefits a well-matured Spirit. In this case however, the ABV is too high for the Young, Delicate, Triple-Distilled Auchentoshan Spirit in my opinion. The Alcohol is way too dominant. I believe that 46% would have been the limit in this case. As it stands, the Valinch reminds me a bit of a Young, Rough Grappa. A little Water does take away some of the heat but it does not resolve the intrinsic imbalance of this Lowland Single Malt. 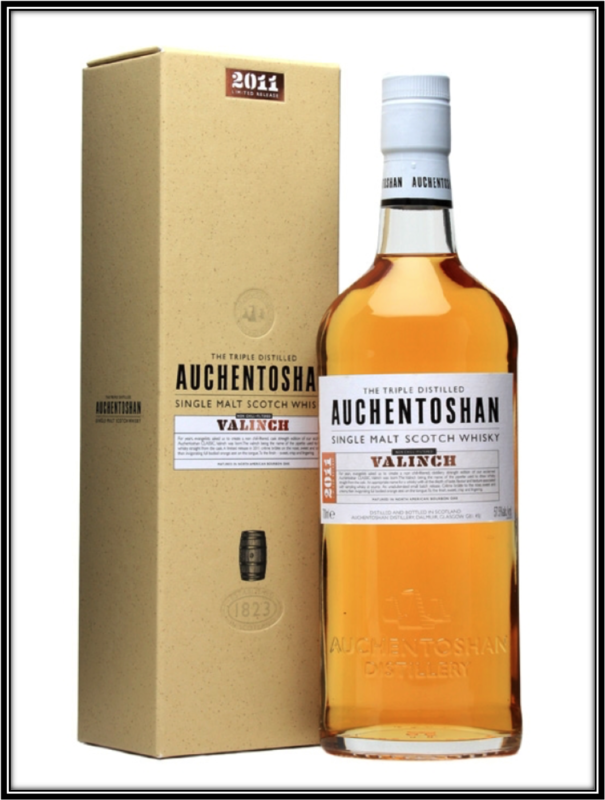 The Price/Quality ratio is okay if you're a big Auchentoshan fan but personally I wouldn't order a bottle of the Valinch. Buying Advice: 😡 Negative. Way too expensive. Stick with the 15! Nose: Sweet and a bit Heavy. It reminds me of a Floral Perfume. The Sherry cask influence is quite clear. I find Dried Fruits like Raisins, Apricots, Sultanas and Figs. Unfortunately I detect a fair amount of Sulphur as well together with a few slightly Sour Red Wine notes. They tend to diminish over time in the glass. The Alcohol is quite present as well I'm afraid. Other familiar Aromas include Malted Barley, Buttered Toast, Brown Sugar, Treacle, Toffee, Caramel, Polished Leather, Grass, Orange, Grapefruit, Canned Pineapple and hints of Tobacco, Chocolate, Wet Stones, Oak, Espresso, Ginger and Menthol. It's not bad but I was expecting much more at this price level. Palate: Sweet and Heavy, almost a bit tired. I find the Dried Fruit from the Nose together with some Malt, Toffee, Caramel, Treacle, Black Currant Jam, Vanilla, Red Wine, Orange, Grapefruit, Chocolate, Oak, Tea, Pepper, Nutmeg, Ginger, Cinnamon, Cloves, Aniseed, Menthol, Dark Honey, Polished Leather, Espresso, Licorice and the faintest hint of Smoke. The Alcohol is still there! Finish: Middle-Long. Sweet at first but quite Dry, Woody and Mineral towards the end. A few slightly Sour and Bitter notes pop up as well. I find Malted Barley, Caramel, Toffee, Vanilla, Treacle, Dark Chocolate, Orange, Grapefruit, Red Wine, light Pepper, Nutmeg, Cinnamon, Licorice, Aniseed, Menthol, Dried Herbs, Tobacco and a sprinkle of Salt. The Alcohol remains present until the end. I added a little Water and on the Nose the Floral - and Orange notes become even clearer. Almost like Orange-Oil. The Alcohol withdraws. Palate and Finish do not significantly change although the Orange becomes almost a bit too dominant. Still, the Cromartie gladly accepts a little Water. 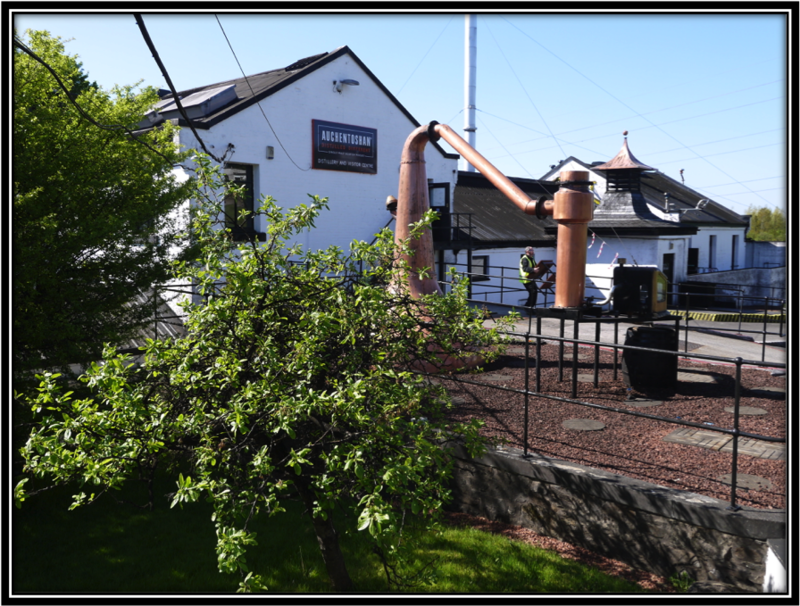 The Dalmore Distillery was founded in 1839 by Alexander Matheson. 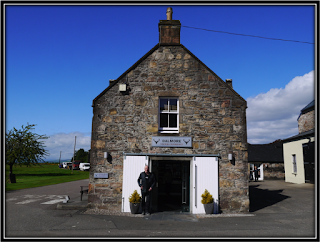 It is located in Alness on the banks of the Cromarty Firth. It is operated by Whyte & Mackay Ltd, owned by Emperador Inc. since 2014. 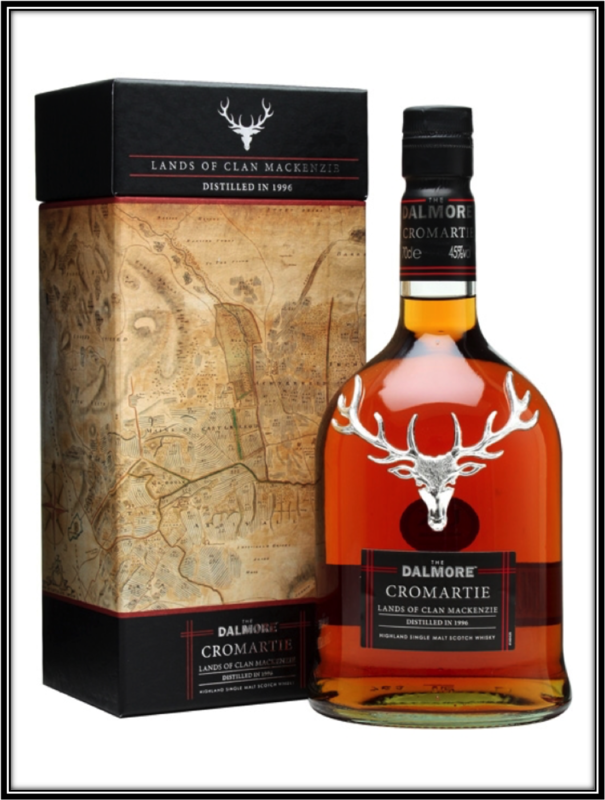 The Dalmore Cromartie was launched in 2012 and is the third in a series of 3 Limited Editions crafted by Master Distiller Richard Paterson to honour the Clan MacKenzie, the owners of the Dalmore Distillery for over a century. The Dalmore McKenzie was the first, released in 2010, followed by Castle Leod in 2011. Together they seek to celebrate the ancient lands of Cromartie, the heartland of the McKenzie clan and home to Castle Leod, the clan's historic seat where they still reside today. A substantial contribution from the sales of these three Expressions will be used to maintain the clan's estates in Cromartie. Only 7500 bottles of the Cromartie went to the market. Dalmore is equipped with four pairs of Stills of various size and form with high Reflux characteristics. Together these stills produce a slightly heavy and more complex Whisky. The Water is sourced from the river Alness. The Cromartie initially rested in American White Oak Bourbon casks before being further matured for a couple of years in Oloroso casks from Sherry Producer Gonzales Byass in Jerez de la Frontera. Richard Paterson decides when the casks are ready for bottling. The Sulphur and Sour Red Wine notes suggest that at least a number of indifferent Sherry casks went in the mix. Conclusion: You would expect that extra good casks would be used for these expensive Limited Editions but somehow I get the feeling that's not the case here. The Alcohol, the Sulphur and the Sour notes would suggest that some less excellent casks were used as well. The standard 15 Years is in fact better in my opinion and it's a lot cheaper. It's perhaps a tad less complex but it doesn't show these off-notes and it's simply a more pleasant dram. Do we need to be careful with all Single Malts that bear fancy names these days? It almost looks like it. 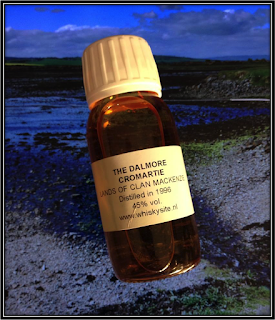 The Dalmore Cromartie is not a bad Single Malt but it's way too expensive for what it offers. No way I would spend more than 50 US Dollars for this! Buying Advice: 😃/😟 Positive as it's a nice Single Malt although it has its flaws. Worried, as it's currently too expensive. Nose: The Sherry Cask influence is clear. There is a little bit of Sulphur around but it doesn't spoil the party. My first impression is a walk in the forest after a rain shower. Damp Leafs, the wet Stones on the path, the wet Moss, Resin and some Mushrooms. After a while we're back to Sherry basics with Brown Sugar, Dried Fruit like Raisins and Apricots, Toffee, Caramel, Treacle, assorted Nuts, Plum Jam, Sweet Apple, Blueberries, Vanilla, Buttered Toast, Toasted Barley, Cinnamon, very light Pepper, Ginger, Oak, light Citrus and a hint of Tobacco. The Malt is certainly mature and the Alcohol is reasonably well integrated. 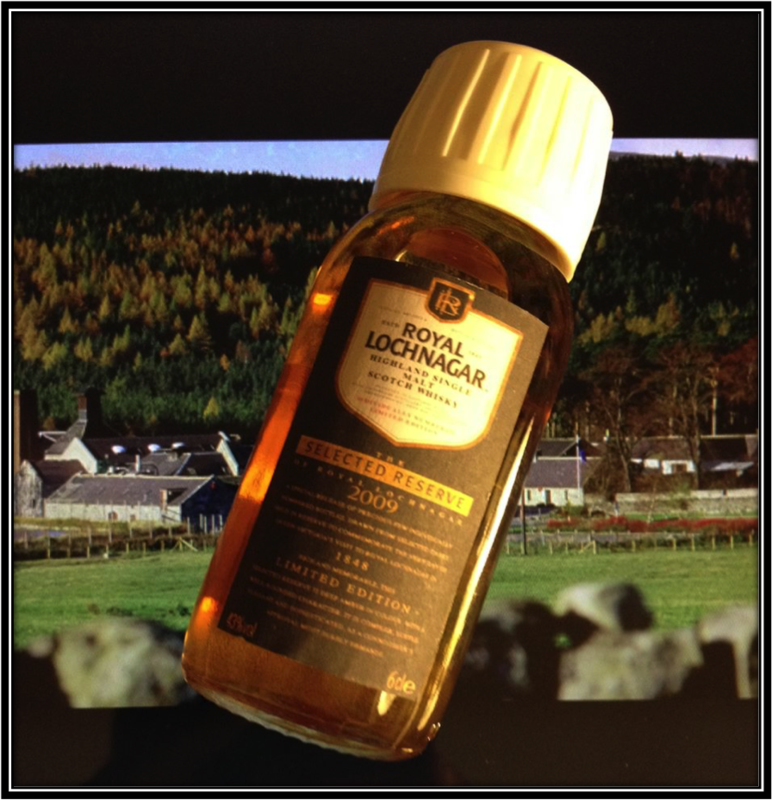 This Royal Lochnagar deserves a slightly higher ABV. Palate: Slightly Thin delivery on account of the relatively low ABV. On the Palate this Royal Lochnagar is mainly Sweet with some Fruit, Oak and Spices. I find Toasted Barley, Brown Sugar, Toffee, Caramel, Blueberry Cupcakes, Dried Fruit like Raisins and Apple, light Citrus, Pepper, Cinnamon, Ginger, Nutmeg, very light Menthol and Latte. Finish: Mainly Sweet but with a few Sour notes as well. Slightly Thin and a bit too short. The Oak and Spices are quite obvious by now. I also find Toasted Barley, light Vanilla, Toffee, Sweet Red Apples, Dried Fruit, Latte, Pepper, Nutmeg, Ginger, Cinnamon, Hazelnut-Chocolate and a hint of Orange Blossom. I added a little Water and on the Nose you get images of a Latte accompanied by some Apple Pie and Cream. Palate and Finish do not change significantly but you can certainly experiment with a little Water here. 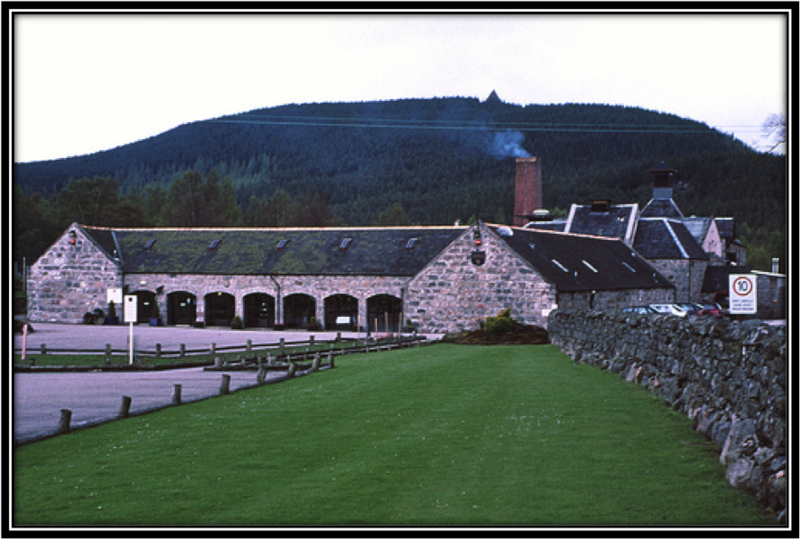 The original Royal Lochnagar Distillery was built in 1823. It was destroyed by fire twice, respectively in 1824 and 1841. In 1845 it was rebuilt by John Begg. It was Queen Victoria's favourite distillery and received its Royal Warrant in 1848. It is located in Lochnagar, Royal Deeside near Balmoral Castle. The current owners are Diageo. Most of the production goes into Blends like Johnnie Walker Blue and Black and Windsor, the most popular Blend in South Korea that was launched in 1996. The core range consists of the 12 Years and the Selected Reserve. The Selected Reserve is a limited yearly edition of specially selected casks of different vintages. 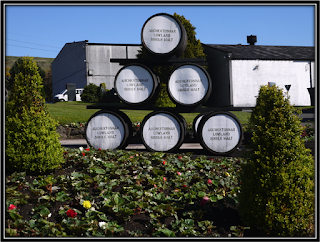 It is launched to commemorate the very day that Queen Victoria visited the distillery in 1848. All bottles are individually numbered. The 2009 release numbered 2982 bottles. It most likely matured in a mix of Ex-Sherry and Ex-Bourbon Casks. This edition is said to contain Whisky of 18 years or older. It's quite expensive and is usually sold in the 150/200 US Dollar range (March 2017). Conclusion: This Royal Lochnagar is a pleasant enough Single Malt but it should have been bottled at a slightly higher ABV. The price would surely justify that. As it is, Palate and Finish are on the Thin side and that's a pity because otherwise this Malt makes a mature and well-balanced impression. A good mix of Sweet and Sour, Fruit, Oak and Spices. I enjoyed the sample and would not mind buying a full bottle. The problem however is the price. It's way too expensive! 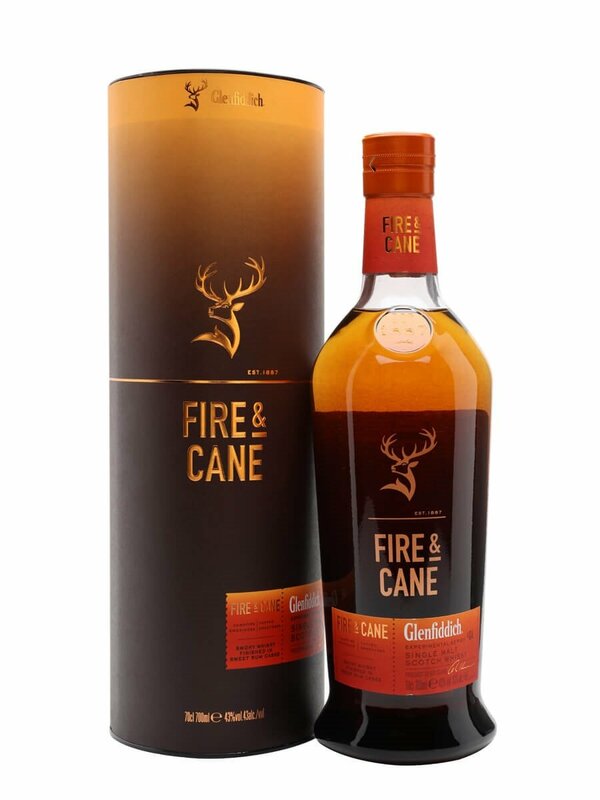 I would kindly suggest Diageo to at least increase the ABV to 46% and present this Single Malt without added Caramel and without Chill-Filtration. It would result in a better Whisky that would justify its price! 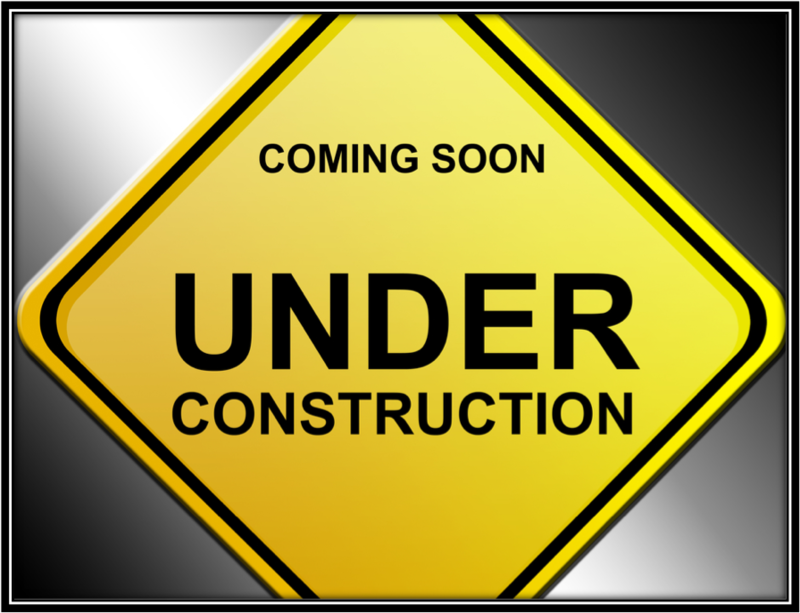 You may have noticed some problems with the Lay Out. 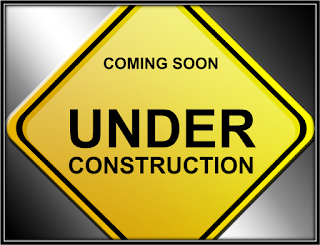 We are trying to solve the issue as soon as possible!